The Purple Planet: Where tribes of man-beasts wage an endless war beneath a dying sun. Where mighty death orms rule the wastes, befouled winds whistle through ancient crypts, and forests of fungi flourish in the weirdling light. Where ancient technologies offer life... or a quick death. Bereft of patron, friend or god, your survival depends on quick wits and a strong blade. Will you and your companions stand as conquerors atop this alien land? Or will you fall beneath the blast of an ink-black death ray, just another corpse left to litter the wastes of the Purple Planet? DCC#84: Peril on the Purple Planet, a 32-page adventure module with gatefold map and wraparound covers. 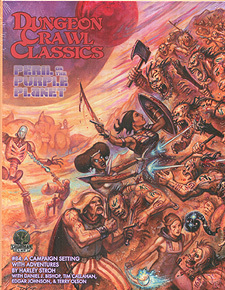 The Purple Planet Companion, a 64-page supplement detailing a Purple Planet campaign. Escape from the Purple Planet, a 12-page starter adventure for 0-level characters. Lost Tombs of the Ancients, a 24-page collection of five more adventures. a 12-page book of handouts.